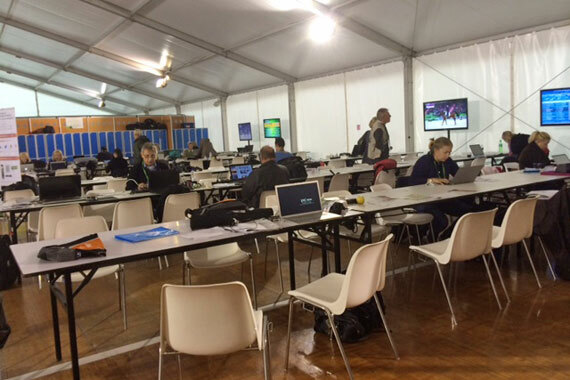 The media centre in Caen starts to fill up as the Games get under way. What a wet day in Caen! Not the weather that we wanted for the start for the Alltech FEI World Equestrian Games, but fans still turned out. The dressage riders got soaked, while some of them just got a trifle wet. This eventing-focused journalist got to watch a few tests, but had a lot of “homework” to do so perhaps tomorrow will be able to give you more of a viewpoint of the dressage proceedings. One of the tasks was to help my colleague Vicki Glynn get a car park pass at Haras du Pin. Vicki and I work together on the Eventing NZ social media at big events like this.Vicki is the one who gives all the details of the scores and what is happening during events, as she bases herself in the media centre where it is easy access to live coverage on the TVs, live scoring and all the information which is shared between the many equestrian journalists in the centre. I’m the roaming one. Back in June Vicki had the misfortune of breaking her leg. Not an exciting story of doing something adventurous to report, but the result is that she would not pass the first vet check, in fact we would not even present her. So we are trying to get a car pass for her so that she doesn’t have to walk too far. All we want to do is get her from the car to the press centre so she can continue to do her fabulous reporting. We applied the proper way for a car pass but “due to the shortage of available car parking” we were both denied a pass. We emailed back in June to explain the situation and had no response. No follow up emails worked either. Various other attempts were made with no luck. I had already attempted to explain the situation at the Accreditation Centre before Vicki arrived in Caen, and had done what I have now termed “the French circle.” This is where you are sent to various different people to get sorted out and end up being sent back to where you started with no solution to your original problem. You are treated with politeness and smiles and charm but do you get what you want? Nope. So, today Vicki arrived and we thought we would try again. We went around the French circle that is at the accreditation centre and spent about two hours there, waiting for various people to help us solve our problem. There were phone conversations with people out at Haras du Pin, including one who said she was trying to organise where the horse trucks were parking. OK, we get that was more important, and she did promise to get back to us, but we have yet to hear. We eventually got to Anna from Media Operations who assured us she would sort something out and ring Vicki on her mobile. That was about five hours ago. No luck yet, but we are always eternally optimistic. In the meantime, we are making backup plans which include very, very early starts, especially on Saturday morning. At this point I am picturing Vicki and our group being driven out to Haras du Pin before the media centre is open, and taking breakfast with us while we wait for the sun to rise. Shame we haven’t got a BBQ to take with us! However, all is not lost as the bar (Bar Beau Site) down the road from our handily placed rented house has now opened after being closed for holidays. The service was excellent, and the wine/beer tasty. This is probably one of the closest “normal” bars (ie, not especially created) to the Stade d’Ornano so we reckon it’s popularity may well increase as the competition goes on. We therefore left a healthy tip – we will be back! Perhaps it could even serve as the place where the Kiwis celebrate after the eventing has finished!